Description: Both my dad, Ray Hughes, and my godfather, Gene Wieczorek, were based out of Sturtevant at various times. Description: Odd fact: western Racine County, WI *is* cabbage country. Description: Amtrak train #352 sits at the Pontiac platform. Description: F40 Cabbage 90215 heads up train 365 on this Grand Morning. 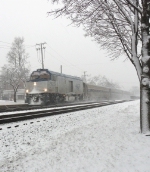 In about Five minutes, it will arrive at the East Lansing station. They arrived exactly 57 minutes late. Photo taken from the Marsh Road Overpass. Description: Westbound through Pine Junction on the on the CSX. Who's had is that? Description: Pokagon, MI waiting on B-1-G out of Kal heading for Niles never showed up got this shot so it was a good day. Description: There's three units you'll probably never see coupled together again. Pure Amtrak. Description: I think these are some of the best looking Dash-8's outside of ATSF's, CNW's, or SP's. That silver just looks good, and nothing like a Widecabbed 4 Axle Unit! Description: Amtrak NPCU 90215 highballs through Riverside with the Illinois Zephyr. Description: Been seeing this one alot lately. Description: An NPCU dashes off into the night. Description: Having arrived just ahead of 365, the Wolverine cools its jets at CUS before heading back out. Description: 8:25AM there was a freight on the siding. Description: A NPCU leads the southbound Hiawatha into the station at the Milwaukee airport.